You were correct in writing to me with your ‘issue.’ You are young and mistakes are to be expected. As your uncle I will give you some advice but I would appreciate if you would keep it just between us. 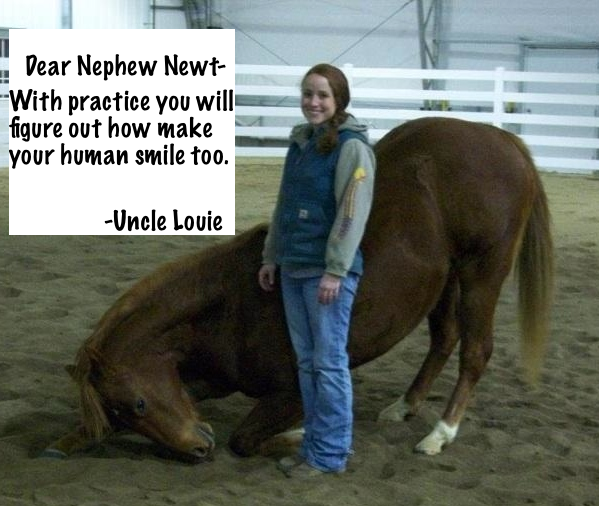 When I was learning to bow….I fell down…well, tipped over would be more accurate. I always jumped up quickly and resumed the bow. My mom just laughed and now my balance has improved and it doesn’t happen anymore. You are correct about waiting for the human to ask. They are very particular about ‘being in control’…no extra lead changes and all that. I have noticed that if I bow when my human dismounts she laughs though…so I throw it in sometimes just to see her smile. I received your letter but have been very busy. I got new shoes again after being barefoot for the winter, show season is coming quickly. It sounds like I will see you next week at the Ekwine Affaire. We will talk more then. 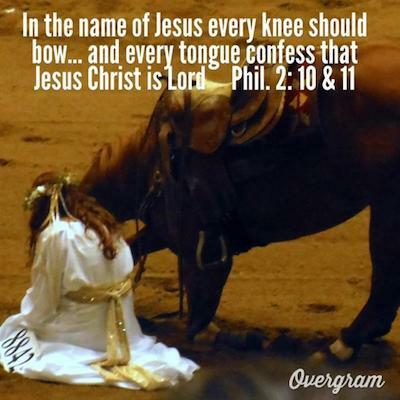 Yes, Stacy, every knee will bow! I so love your advice and encouragement and truth! what they are thinking and it is just so good and makes me laugh…. you have managed to entertain me yet again with these “Horse View” blogs….lol…. now I’m ready to see Jac do his bow! !